Partial Birth Abortion is a late-term abortive procedure in which all of a fetus (except for the head) is removed from the womb through the cervix (the same pathway through which birth occurs; hence the name), and is then killed. The official medical term is "intact dilation and extraction" abortion. The procedure accounts for 0.17% of all abortions in the U.S., but due to its grisly nature, has become an important battleground within the greater abortion controversy. Cranioclast: an instrument used to crush the skull so as to allow the extraction of a dead fetus during obstructed labor. Prior to Roe vs. Wade and Doe vs. Bolton, there was no such concept as a post-viability abortion. Abortion was, by definition, the death, either natural or inflicted, of a pre-viable fetus. The closest practice to what we know as late abortion was the destructive operation, performed to remove a fetus who had died during obstructed labor. The destructive operation is sometimes still used in areas that lack the medical facilities to perform safe Cesarean sections, but elsewhere it has been supplanted. With Roe and Doe, the Supreme Court declared that there was a Constitutional right to an "abortion" even past fetal viability. US abortionists thus were limited in scope only by their own willingness to destroy fetal life. It was only after the Planned Parenthood vs. Casey decision that states were permitted to limit post-viability abortions. Many still do not have, or do not enforce, laws that Casey had established as enforceable. In the immediate post-Roe era, abortions past the midpoint in pregnancy were typically performed by instillation, in which drugs or chemicals, alone or in combination, were used to cause fetal demise and induce labor. These abortions carried with them numerous drawbacks. They were risky for the mother, since the chemicals used to kill the fetus could severely injure or even kill the mother if they entered her bloodstream. They were also logistically challenging, requiring a typical multi-day hospital stay. Furthermore, they required a delay until about 16 weeks into the pregnancy, prior to which point there was not sufficient amniotic fluid for the practitioner to extract and replace. The dilation and evacuation (D&E) abortion technique had already been developing, "in part because surgeons needed a `right now' solution to complete suction abortions inadvertently started in the second trimester and in part to provide a means of early second trimester abortion to avoid necessary delays for instillation methods." As practitioners became more skilled and more confident, they performed D&E later and later in pregnancy, and this method began to eclipse the use of instillation methods. As one practitioner noted, "Classic D&E is accomplished by dismembering the fetus inside the uterus with instruments and removing the pieces through an adequately dilated cervix." He also noted that at and beyond 20 weeks of gestation, most abortionists found the fetal tissues too tough to easily tear apart. Thus, methods were developed to kill the fetus in-utero a day or more prior to dismemberment, so as to allow autolysis or softening of the fetal tissues. This method, however, also carried a risk of infection. [D&E abortions up to 24 weeks] were very tough. Sometimes it was a 45-minute operation. I noticed that some of the later D&Es were very, very easy. So I asked myself why can't they all happen this way. You see the easy ones would have a foot length presentation, you'd reach up and grab the foot of the fetus, pull the fetus down and the head would hang up and then you would collapse the head and take it out. It was easy. At first, I would reach around trying to identify a lower extremity blindly with the tip of my instrument. I'd get it right about 30-50 percent of the time. Then I said, "Well gee, if I just put the ultrasound up there I could see it all and I wouldn't have to feel around for it." I did that and sure enough, I found it 99 percent of the time. Kind of serendipity. The technique gained popularity after Haskell presented a paper about his refinement of the technique, which he was now calling dilation and extraction or D&X, at the 1992 National Abortion Federation (NAF) Risk Management Seminar in Dallas, Texas. Haskell's presentation paper, distributed through NAF's mailing list, fell into the hands of cartoonist Jenny Westberg. 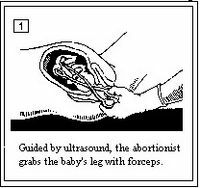 Westberg wrote an article on her discovery, also providing the now-infamous line drawings of the procedure, for the February, 1993 issue of Life Advocate, a limited-circulation pro-life periodical then published in Portland, Oregon. National Right to Life seized upon the line drawings, along with Haskell's presentation paper, and with state affiliates launched a multi-front legislative battle against what they dubbed "partial-birth abortion" or PBA. Though abortion advocates typically present all late-term abortion as being performed for "hard cases" (severe fetal abnormalities or serious health problems in the mother), late abortions, including PBA, are typically performed for the same reasons as earlier abortions. Congress passed laws to ban the procedure in 1996 and 1997, but the bill was vetoed by President Clinton and Congress was just short of the votes necessary to override it. The United States Congress enacted the Partial Birth Abortion Ban Act  in 2003 and President Bush signed it into law. The Supreme Court upheld the ban by a 5 to 4 decision in Gonzales v. Carhart, on April 18, 2007. "knowingly perform[ing] a partial-birth abortion...that is [not] necessary to save the life of the mother," 18 U.S.C. Section 1531(a). It defines "partial-birth abortion," Section 1531(b)(1), as a procedure in which the doctor: "(A) deliberately and intentionally vaginally delivers a living fetus until, in the case of a head-first presentation, the entire fetal head is outside the [mother's] body..., or, in the case of breech presentation, any part of the fetal trunck past the navel is outside the [mother's] body..., for the purpose of performing an overt act that the person knows will kill the partially delivered living fetus"; and "(B) performs the overt act, other than completion of delivery, that kills the fetus." ↑ Cates, W. Jr., Schulz, K.F., Grimes D.A., et al: "The Effects of Delay and Method of Choice on the Risk of Abortion Morbidity," Family Planning Perspectives, 9:266, 1977. This page was last modified on 9 April 2019, at 13:56. This page has been accessed 28,838 times.